It's always a tricky for journalists to decide which of the many rumors we hear or see published ought to be believed or reported. Usually we tread on the side of caution, but the R-J threw that out the window today. The Cosmopolitan of Las Vegas has been open for less than a month and already there's been talk on the Strip of Deutsche Bank AG being unhappy with executives at its $3.9 billion property. 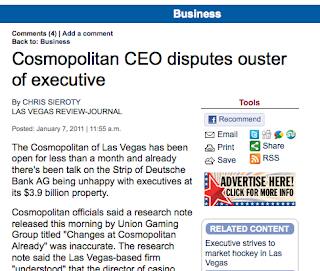 "We understand that Cosmopolitan has let go of its head of gaming operations believing that life-to-date the property had under-held notably." That would be John Zaremba. He remains with the company in the same position. Spokeswoman Amy Rossetti says there's no reason to expect him to leave or lose his job. Maybe Rossetti is spinning the stability of Zaremba's employment status. That doesn't matter. Lerner said the guy was gone. The guy isn't gone. In my world, that means Lerner's intel is flawed and not credible. In Sieroty's, evidently, it means you write the juicy story about troubles at the Strip's newest joint anyway. Even if Zaremba is canned next week, it doesn't matter; Lerner's note was factually wrong. Period. But, anyhow, when did Lerner become such a credible source that his musings were news and refudiations of his remarks worthy of coverage? Was it when, a year ago, he advised investors that, based on the very scientific and fool-proof metric of eyeballing the scene at newly open CityCenter, that that New Year's "may have been the strongest in MGM Mirage history?" (It sure wasn't.) 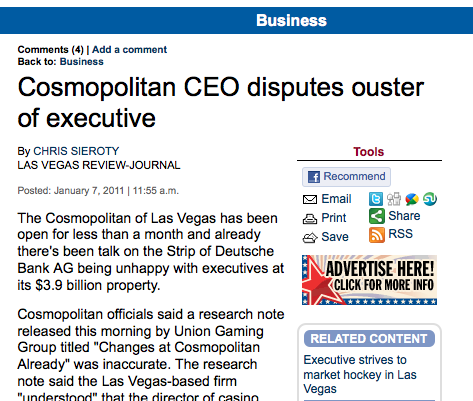 When he titled a research note in January 2010: "2010 Off To Good Start in Vegas, MGM Most Leveraged to Recovery?" (It also sure wasn't and Wynn and Sands were the biggest beneficiaries of whatever recovery happened last year.) Lerner's pro-MGM bent overwhelms all his analysis, and Sieroty should have at least noted that in giving context for Lerner or, better yet, not re-reported a disproved piece of gossip at all. We can't know from the outside how Cosmo is doing yet for a couple of reasons. First, it's a privately held resort, so there's no obligation to publicly tell us. Second, its brief life has spanned at least two anomalous events -- New Year's Eve and CES -- that don't speak to how it'll be doing in critical, less intense periods after the newness factor has worn off a bit. I understand Sieroty's itch to have something to say, but he'd be better served to pay attention to someone like Robert LaFleur of Hudson Securities, who traffics in data, not idle speculation and gossip. LaFleur, you may recall, tracks resort room rack rates weekly to see where resorts are raising and lowering the prices, an indicator of how they feel about their bookings. His latest dispatch, from Jan. 4, 2011, indicated: "So far, Cosmo is adopting a very aggressive pricing stance relative to the market. We will see if it is sustainable." That's real analysis. As is this, showing Cosmo pricing is above even Bellagio by a significant margin. Now, that may change. It could plummet. In fact, I think it's sort of likely that it will; it's hard to conceive that Cosmo will charge more than Bellagio in the long run. But none of the actual data available suggests Deutsche Bank is so unhappy with the property performance that they're trying to sack top executives. Again, Lerner may someday be proved correct. But to paraphrase Sen. Daniel Patrick Monyihan, while he's entitled to his own predictions, he's not entitled to his own facts. re: your Moynihan mangling: You're entitled to your own opinion, but not your own definition of paraphrase. a clever attempt, even if the quote is now way over-saturated. moynihan likely borrowed it anyway. steve didn't misuse the term paraphrase, so this anonymous commenter is an idiot. I recall Learner was the analyst who, last summer, said Cosmo would be able to charge about twice as much per night as Wynn & Bellagio because it was so cool. "But, anyhow, when did Lerner become such a credible source that his musings were news and refudiations of his remarks worthy of coverage? "